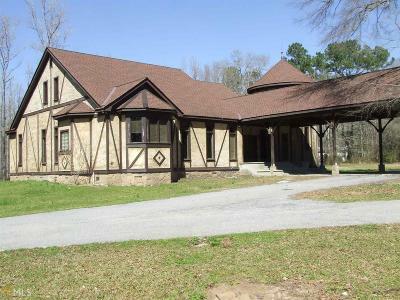 A rare and unique property with 7 ponds on on this 11;07 acre wooded lot. One story home that has attic space for 2 more BR and a bath. The home needs some TLC but could be a showcase! It features hardwood floors, exposed beams,wet bar, high ceilings, and 3 fireplaces. The expansive kitchen would be fit for any cook with room for a restaurant style gas stove and a huge refrigerator. The master BR suite is over 1,000 sq ft with a walk-in closet, cozy fireplace. The master BA has a jetted soaking tub, dual vanities, massive shower with bench & rain shower. The house also has a round turret room that could be used as a dining room. Directions: Take Ga Hwy 85 To Shiloh- Turn Right On Kings Gap Road To House On The Right.